Microsoft didn't say when it would ship or for how much, but the new perspective is intriguing. 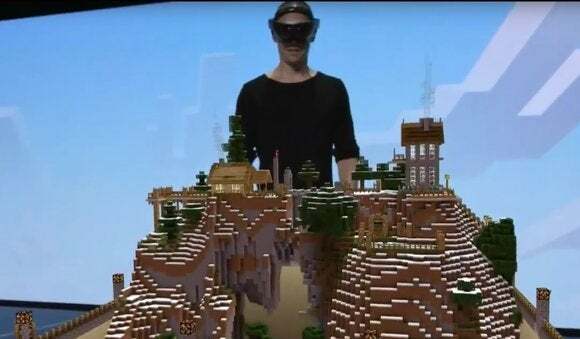 As anyone who attended Microsoft’s January HoloLens demonstration could have figured out, Minecraft will be the first game Microsoft will publish for its augmented reality headset. Microsoft executives confirmed those plans Monday, at the company’s showcase at the E3 gaming conference in Los Angeles. Although Microsoft executives showed off how the game will look and play, they didn’t reveal details, such as the price it will charge for the game or when it will ship. Minecraft for HoloLens doesn’t appear to be a recreation of the Minecraft game at all, really. Instead of a first-person perspective, players can assume a god-like perspective that allows them to view other players from above, or dive down into the scenery to explore below the surface of the game world. Using the HoloLens, Saxs Persson of Microsoft Studios was able to track Lydia’s progress playing Minecraft on a Surface tablet. Persson was able to zoom in on Winters using a “Follow Player” command, and trigger a simulated lightning storm as well. He was also able to virtually create dynamite to blow a virtual hole into the Minecraft underworld. Why this matters: Minecraft contains two modes: a “survival” version, where users play within a dynamically generated world, and a “creative” mode, where players construct a world from scratch. It appears the version of Minecraft that Microsoft envisions for the HoloLens could be a bit of both, where the HoloLens user plays the role of a “dungeon master,” tweaking the world and putting in obstacles for the player to interact with. Did it look fun? Possibly, depending on how much you can interact with mess with other players. And heck, when you spend $2.5 billion to buy a video game, you need to justify your investment somehow. 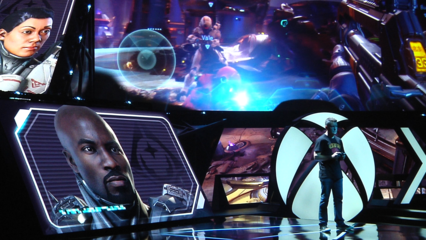 The demonstration at E3 looked very similar to what Microsoft showed off in January, as part of the grand unveiling of the HoloLens technology. There, attendees had a chance to walk a virtual Mars landscape, wire up an electrical switch, and then virtually explore a Minecraft simulation. The difference between the two demonstrations was subtle: In Redmond, the HoloLens visor mapped out the surface of a room, including a table and chairs, and brought them into the Minecraft world. At E3, Microsoft used a tabletop to simulate a Minecraft environment that appeared to have been already simulated. Both were impressive, allowing the camera to peer down “into” the virtual world, nestled inside the physical environment. How will it all play out? Well, first Microsoft has to ship the HoloLens—and it hasn’t given a formal date for that, either. The best guess is that we’ll see this part of Microsoft’s augmented reality vision realized next year.